Not my usual smoothie, smoothie bowl, or post but it’s my birthday! I decided to do something a little different today. I’m actually in Yountville today and I’m going to go to Chandon Winery today so I decided to whip up this “smoothie” bowl, of course before I left town. I like wine and I’m all about living a healthy, happy, balanced life! It’s all about living your best life and mine is being healthy, eating healthy food most of the time so I can live a long full life, and enjoying every moment of it and that means some treats and not depriving myself. This year I said I would try to connect more with my readers and put myself out there more. So that said I figured I’d share a little about me and learn more about you. So I’ll sit here and spoon my smoothie bowl and spill it, since when I do drink wine I tend to talk a lot! I’m in my mid 30’s yep still sticking with mid even though I wouldn’t want to be in one of those round up or round down situations. Age is just a number anyways and I don’t feel old and many people don’t believe me when I tell them my age. I’m a wife, married to an amazing man for almost 15 years. The reason I’m in Napa right now is celebrating our 15 year wedding anniversary. I’m the mom of two wonderful sweet girls, S is 13 and A is 8. We are a very active family that loves the outdoors but also our shopping and girly things, well the girls and me anyways. We live in Minnesota, the land of 10,000 lakes! In the summer we get out and kayak on those lakes, no not all 10,000 of them. My husband is a runner, the girls both play traveling soccer and A also does gymnastics. I use to be a HIIT lover but fell in love with barre in December when a new studio opened up here and I hit the Founding 50 last month (one of the first fifty, I was the 3rd, to hit 50 classes when a new studio opens up). I also do strength training with my husband twice a week and we all do fun runs as a family. We also have two puppies, well not really “puppies” anymore. Life gets busy juggling it all and the blog but most days I wouldn’t have it any other way! Food, we love food! Haha! I was diagnosed with Celiac over 10 years ago but years later found out it’s a sensitivity. I use to avoid most gluten as it doesn’t make me feel the best. If you follow along on Instagram you’ll know that my husband started making homemade sourdough bread just before Christmas and my gluten sensitive tummy has been handling it so well. So well we’ve been making bread weekly and in the month after Christmas I had already eaten more bread since I had in the whole previous year. Yes life changing and we don’t get it but my husband is researching more and more and we are even doing double rises now which breaks down the glutens even more. He’s also making fresh homemade pasta, seriously killing me with carbs and I’ve had more carbs so far this year in the last 2 years I bet! I also avoid dairy most of the time as it also doesn’t do well with my tummy. However when I’m out I don’t avoid it 100%, the family does eat dairy. My oldest cut it out to see if it helped with her tummy issues but it didn’t seem to but she has cut back on it. I love yogurt and it was the hardest thing for me to cut out, my tummy just didn’t handle it well. When we were in Ireland a couple years ago I had yogurt and my tummy did ok so from time to time I try to add it back in but over do it. Things have obviously changed over the years with my eating and our eating in general. When I first started the blog over 4 years ago it was different than 2 years ago, a year ago, or today. I did cut out all meat, dairy, and eat plant-based “vegan” for awhile but last year stopped that for medical reasons. I had to cut out soy but from time to time try to add that back in but again it’s not an every day, weekly, or even monthly thing. Lately I have gotten some questions about being vegan, vegetarian, ect as I sometimes post eggs or fish. First my family doesn’t have any allergies or restrictions so sometimes I add in their options as I usually make a meal that can be added on or customized for each of us easily by adding or not adding things. In general we just like whole foods, heavy on the veggies, fruits, grains, aka carbs and healthy fats. I eat what works for me, which like many people changes from time to time. I eat mostly plant-based foods. I love fruits, veggies, grains, whole foods in general. I do eat eggs and seafood, not often but I do. I go in phases where I eat more some times than others. So I guess I’m a whole food flexitarian carbivore, this week. Although only my husband and oldest are “big” meat eaters, but in general our meals are pretty whole food based with lots and lots of fruits and veggies. I just eat what my body craves (meat is not one of those things) and what makes me feel good (my tummy doesn’t usually handle dairy and gluten well). So that usually means, avocado, green juice, peanut butter, nut butter, chocolate, smoothies, smoothie bowls, chia seeds, nuts, kombucha, veggies (umm beets! ), fruit (all of them! ), ice cream, museli, wine, popcorn, coffee, and bread (not just any bread!). As our diets and nutritional needs and bodies change over time recipes also change as the girls get older. My youngest and I use to have “art in the kitchen” time as I stayed home with her so we had a lot of fun creations we would post and we had a lot of fun kid classics, like a blog fav Peanut Butter & Jelly On A Stick. As the girls got older recipes changed, more snacks and power bites to fuel soccer and gymnastics. I just want to instill healthy habits in the girls and have them love food and have a good healthy relationship with it. As I said there aren’t any off limits foods but they make good choices. We can have candy sitting out from holidays for months and they don’t touch it. They can have pop if they wanted but instead drink lots of water and like kombucha, probiotic drinks, tea, and my oldest her chia drinks. Yes we have ice cream and treats, last years Monthly Family Foodie Date Theme was donuts and we always bought over a dozen. That said we didn’t even eat a fraction of it just taking bites out of them and enjoyed what we wanted but didn’t feel the need to overdo it and eat it all. The girls make their own lunches for school which are mostly fruits and veggies and they usually make them. I can’t tell you how many times I get a text or call from their friends parents inquiring about a food their child tried or they had at our house. The girls are more involved in the overall food choices as well. So probably more than you wanted to know if you stuck with it. So now I want to know more about you, what are some of your favorite foods? What recipes do you want to see more of? Less of? Anything else you want to share I’d love to hear. 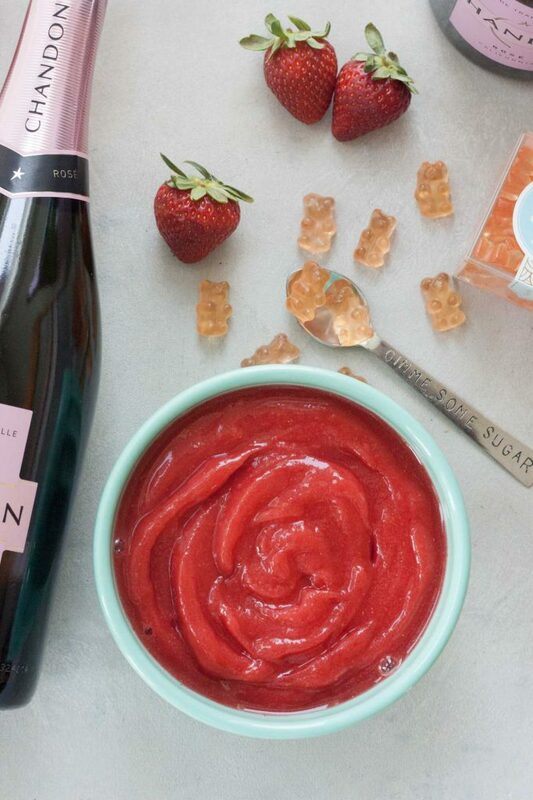 Now to a fun little drink that isn’t anything new, a wine slush where you just blend frozen fruit and wine together. 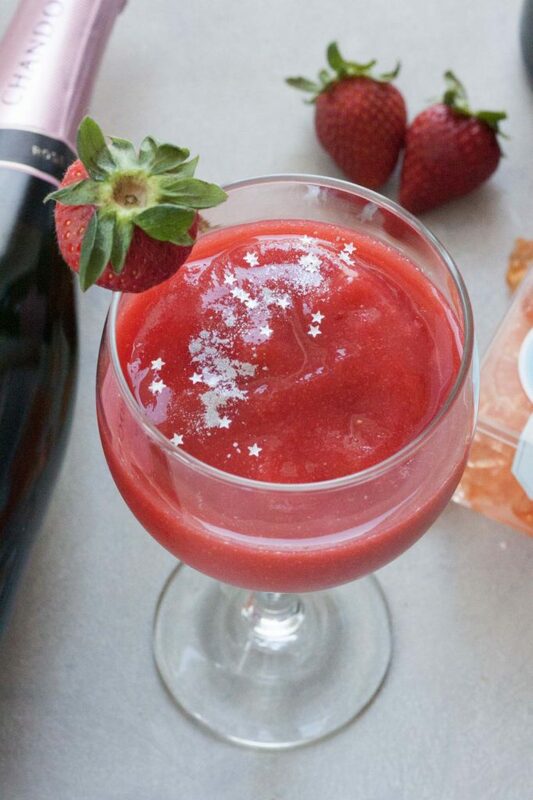 In this case frozen organic strawberries and Rosé. Step that up a notch to make this extra thick and creamy Rose All Day Smoothie Bowl! Great to enjoy on the patio in the summer, for a girls weekend, or while watching The Bachelor/Bachlorette if you’re a fan of the show like I am. 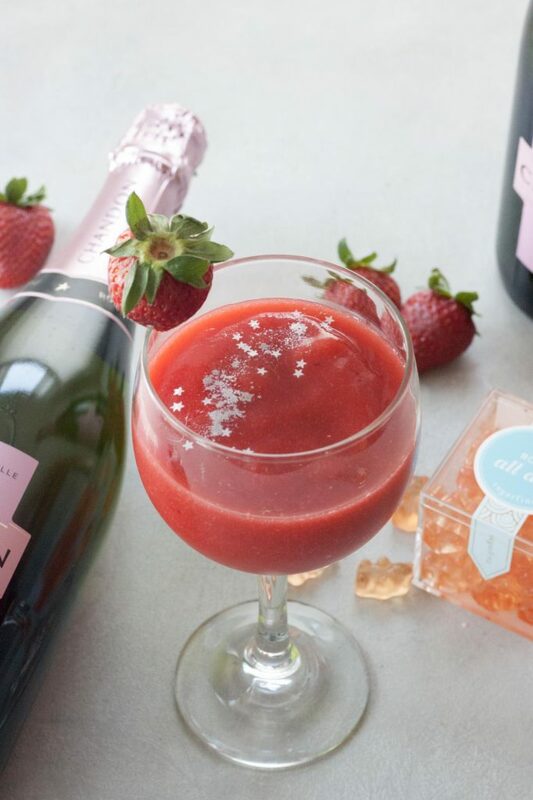 In a Vitamix, or high-speed blender, blend wine with strawberries starting with 1/2 cup and adding more as needed to reach desired consistency using the tamper tool if needed and making a smoothie bowl. Enjoy! 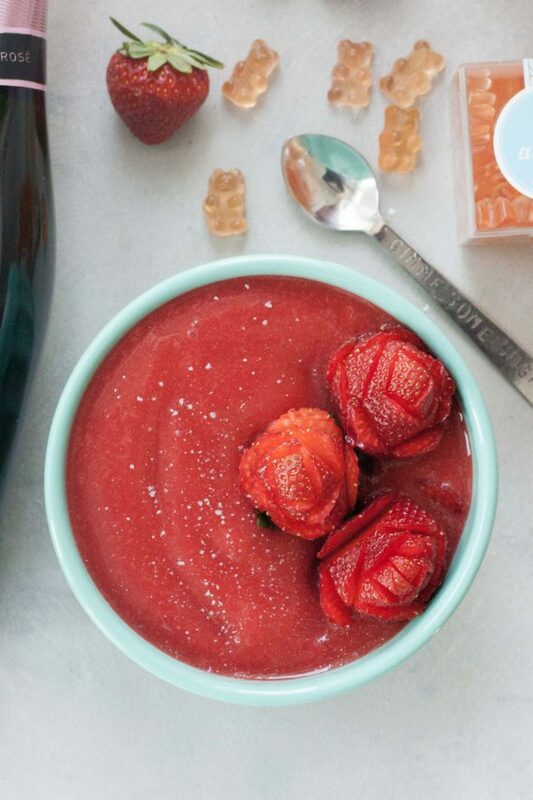 Turn frozen fruit and wine into a fun Rosé All Day Smoothie Bowl! Happy Birthday! This looks lovely! Hope you habe a wonderful day, friend! I like how you described your family’s way of eating. IT just sounds so balanced and not obsessive at all. 🙂 I LOVE whole foods (with a few donuts and ice cream on the side). HAPPY Birthday to you!